has fantasy heroes of practically every category, introduced Blade, Vampire Hunter, almost two decades before Buffy. Blade was first seen in the 10th issue (July, 1973) of Marvel's Tomb of Dracula, wearing a bandolier which, instead of bullets, held wooden stakes for pounding into the hearts of his foes. His origin story, which appeared three issues later, provided both motivation for his lifelong hatred of vampires and, like those of most Marvel characters, a source of the extra-normal powers that qualified him as a superhero. It seems Blade's mother (whose name was never mentioned, nor was any name other than "Blade" given for the Vampire Hunter himself) was bitten by a vampire just as she gave birth to him. Her friends rushed in, which sent the undead creature (Dr. Deacon Frost, a pipsqueak compared to Marvel's Dracula but still a vampire) running for his "life". The woman died anyway, but Blade lived. What's more, the close brush with vampirism inoculated him, giving him lifelong immunity to the supernatural effects of such bites (tho he could still be physically injured by them). The character was created by writer Marv Wolfman (Teen Titans, Dial H for Hero), and visually designed by artist Gene Colan (Daredevil, Night Force). He remained a source of dramatic conflict for the comic's villainous protagonist, as long as the villain lasted — which was far longer than the Tomb of Dracula title, which ended in 1979. He also had a bout with Morbius the Living Vampire. 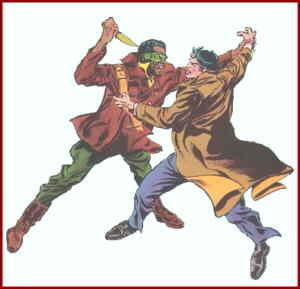 Vampires were totally eliminated from the Marvel Universe in a 1980s Doctor Strange storyline, after which Blade continued to appear occasionally as a private detective. When they were de-eliminated in the '90s, it was back to vampire hunting as usual for him — in fact, he even got his own comic in 1994, tho it lasted only ten issues. In 1998, Blade hit the big time — a feature-length movie about him, with Wesley Snipes in the title role and Stephen Dorff as Deacon Frost, was released by New Line Cinema on August 18 of that year. Wolfman, claiming that as a freelance writer he retained title to the original characters appearing in stories he wrote for Marvel, sued the publisher for having usurped his ownership of both Blade and Deacon Frost. Writer Steve Gerber's earlier suit on similar grounds for Howard the Duck was settled out of court, but Marvel eventually won against Wolfman — not because Wolfman didn't own his supporting characters, but because the judge decided Marvel had altered the character enough since Wolfman's tenure, to where it was no longer really his. Another comic book series about Blade ran from December, 1999 to May, 2000. Snipes reprised his role in a second movie, released March 21, 2002, tho the Frost character doesn't appear in it (possibly because of Wolfman's claim). A third film, also with Snipes, came out in 2004, and a TV series in '06. So it looks like Blade will be hunting those vampires for some time to come.